I was watching the BBC’s One Show last week featuring the lead actor from the new Black Panther film – Chadwick Boseman. The guest host who was Jeremy Vine had asked how special it must be for Chadwick to be in a mostly ‘all black’ cast for this film and he replied ‘It’s special, but I do it all the time.’ Will we ever get to a place where epic films like this are less of a novelty and have a regular place in main stream cinema? I think for many this film signifies many boundaries being pushed on all levels, not least with a black super hero in a major film franchise. As Oliver Pometsey said recently ‘This film is more than an exercise in diversity for Hollywood, it’s a lesson on how to recover and move forward from society’s mistakes.’ It is certainly empowering to witness black children finally get an opportunity to truly see themselves as heroes on screen. This has been celebrated with whole cinema screenings being booked for schools to see the film together. The Black Panther film is the 18th installment in the Marvel series but not the first black comic-book character to have an exclusive film (Check Spawn and Blade). 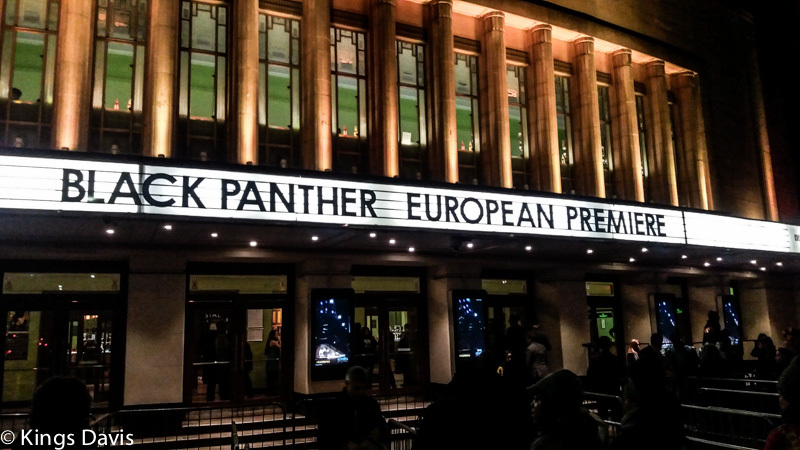 However The Black Panther is the first to embrace ‘Afrofuturism’ – a concept to science fiction and fantasy with roots in the black experience and the cultures of the African continent. The creators of the film have aimed for authenticity by drawing on research trips to Africa, historical resources and specific cultural references. The cast is a mixture of African and African-American actors, and the national language of Wakanda is, in fact, Xhosa. On first impressions it seems to be a movie of substance as well as style. 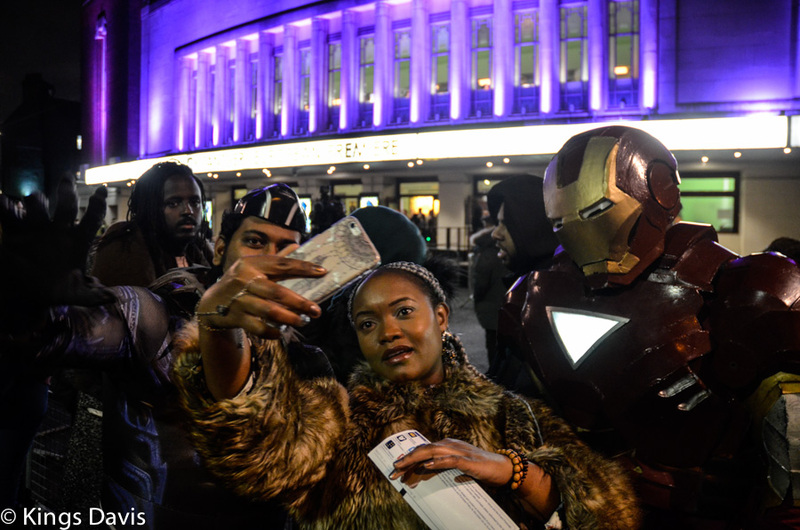 I made it a priority to drop by the European Premiere in Hammersmith (London) not just to see the film but soak up the energy of the people. 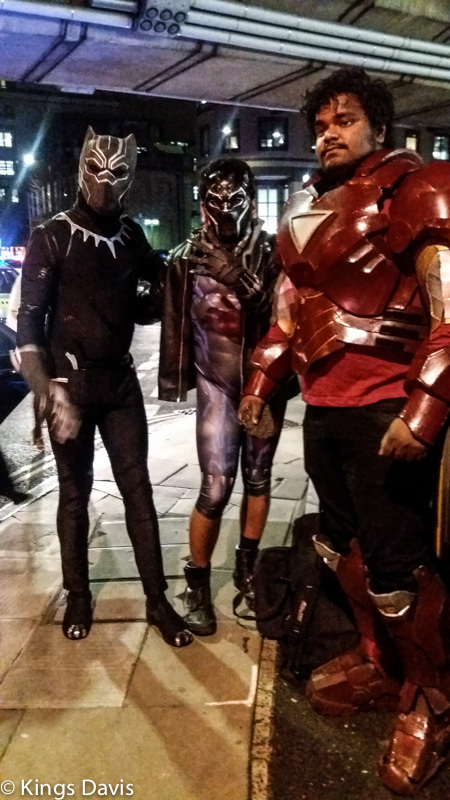 The buzz on the street was apparent all through the evening, many turning up in Black Panther and other super hero costumes (see images below). There is a sense we are witnessing a special moment in cinema while inspiring the next generation of black children.